Hey guys what is good? It's ya boy King DeeZee coming at you again with a another fresh Weekly Roast! I wanna begin this week by letting you guys know that our weekly meetup at The Recreation Station in Texarkana will be returning again this coming Wednesday the 29th! Is that two weeks in a row?! You bet it is! We will be returning to a bi weekly rotation after this coming Wednesday, but we are here two weeks in a row this time! You guys come out and lets see what you got! Speaking of the bi weekly meetup, the story of this week is my man Shiro! Shiro came out and dominated everyone all night in Smash 4 singles and won the tournament straight from a stacked winners bracket including former champions! This man came out and did his thing, so congratulations once again to Shiro! If you weren't able to check out the stream, check it out on our archives here: https://www.twitch.tv/videos/300666215 Be sure to click that like button on our channel as well if you haven't already! We ran doubles brackets in Smash 4 this past week, and next week we will be running doubles again! We may make it a standard for every meet up, so come out and bring a partner! 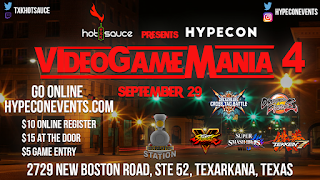 I'll end the weekly roast this week by putting in a plug for our tournament, Video Game Mania 4! September 29 is just a month or so away, so get ready! We hope to see you all there!!! What's poppin' ladies and gents? It's ya boy King DeeZee back at it again with the weekly roast! 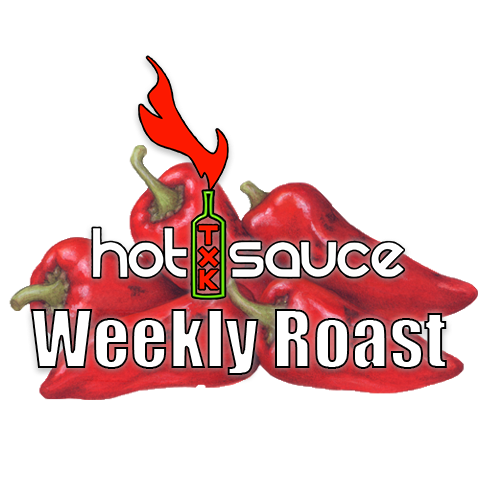 Things are going crazy here in the world of Txk Hotsauce, and we're super excited about the coming months. The Evolution World Fighting Game Championships were this weekend, and the Hotsauce crew is all sore, blistered and nursing sunburns from all the festivities that took place at the house of Hotsauce this weekend. Evo was a blast, and if you didn't watch it, you should definitely check out the matches. We are pumped to see how our meta evolves here in our community after this weekend, and see who can come out on top after the biggest fighting game tournament in the world! Don't forget, coming up this Wednesday, August 8th, we're back at the Recreation Station on New Boston road in Texarkana, TX for our Bi-weekly meetup! We have some cool new things planned for this week, including the introduction of some new equipment for our players, some upgrades to our stream, and MAYBE, just maybe, the return of the bowl whose name shall not be mentioned. Let's see who shows and bodies everyone! Be sure to come out this week for all the hype and shenanigans! Last but not least, if you didn't catch the news, new characters for about every current fighter were unveiled and even released over the weekend. We now have G and Sagat in Street Fighter V, and a ton of new characters in Blazblue Cross Tag. Base form Goku and Vegeta, as well as Cooler were revealed for Dragon Ball Fighter Z. Finally, brand new mechanics were shown for Tekken 7, as well as Lei Wulong, Anna Williams, and NEGAN from The Walking Dead! 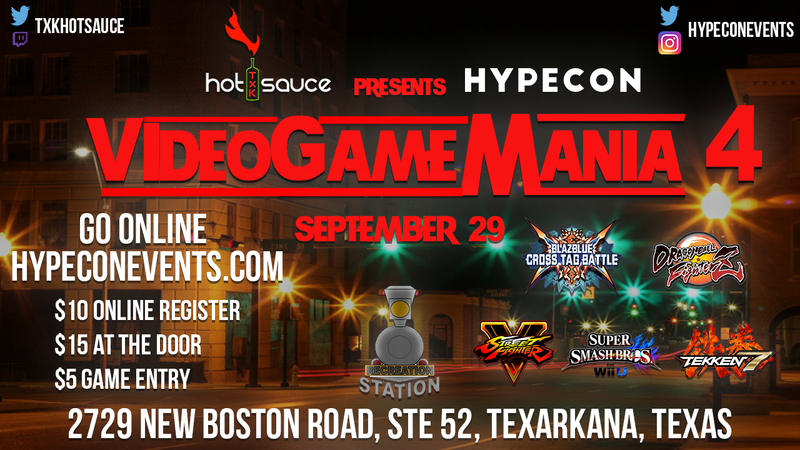 Things are getting awesome here in Texarkana for fighting game fans, and we want all of you to be a part of it. Everyone come out this Wednesday and get some games with us. Maybe you will show up and surprise everyone. Shout outs to my boy Andy Kim on the DBFZ surprise victory last time! See you guys and gals Wednesday! PS. Here piggy piggy. Lucille is hungry. Hello there folks! It's ya boy King DeeZee back at it again with a new concept that I have been meaning to implement: a weekly update for all of our followers and players! The WEEKLY ROAST! I will be posting this weekly just to let you all know what's going on in the world of txkhotsauce! Everything that's exciting, not exciting, mildly exciting, and especially things that are FIRE! 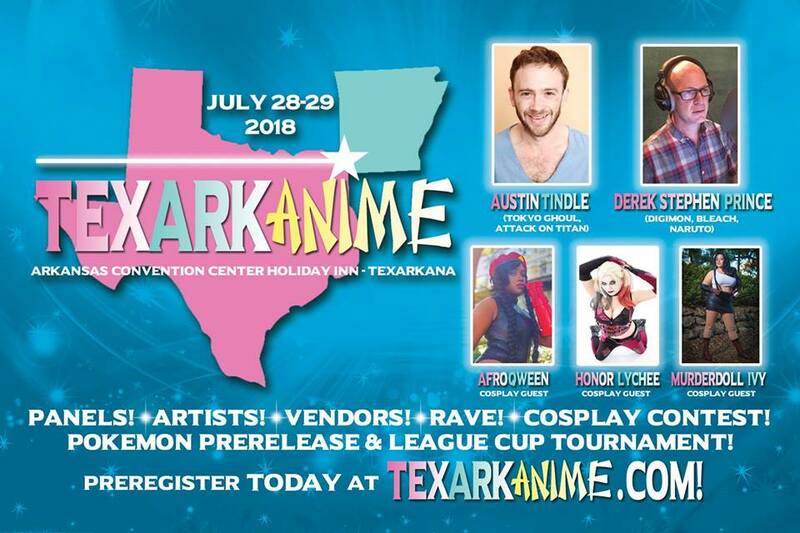 First and foremost, Texarkanime was a HUGE success! I want to give a big shout out to the awesome crew there! Their convention was absolutely stellar and a huge addition to the town of Texarkana. Thanks to all the players that showed up and chilled with us as well! This was a big eye opener for txkhotsauce as to what we can do as an organization, so once again, big BIG thanks go out to everyone involved in the convention this weekend! Be sure to visit www.animeconarkansas.com for more info on their events! 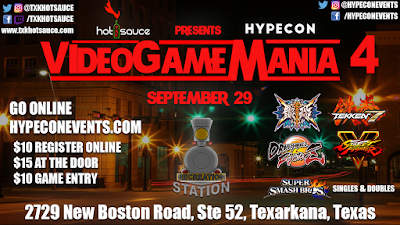 We are less than two months away for VIDEOGAMEMANIA 4 @ the Recreation Station here in Texarkana, TX. This is our flagship tournament and we couldn't be more excited and driven to bring you guys the best experience possible. This will without a shadow of a doubt be the biggest event we have put on and we want to see everyone there to show us what our local players can do here in TxK! All of you folks traveling in have been put on notice! Come down here and get SMOOTH BODIED! 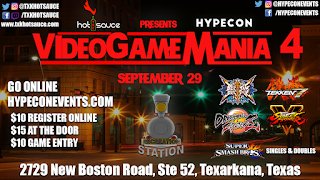 Be sure to register online @ www.hypeconevents.com before tournament day, September 29th!!! That's whats going on for now! Be sure to check in weekly for more updates! ps. I know you all saw those ghost peppers. You aren't ready. 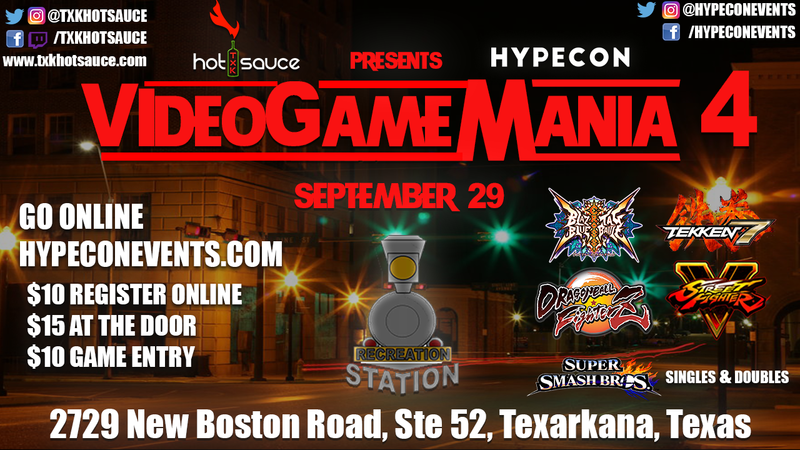 We will be hosting a tournament for Super Smash Bros. Wii U, Blazblue Cross Tag Battle and Dragon Ball Fighter Z at this event. 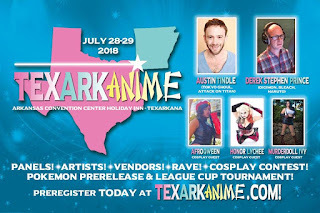 Check out the details at their website texarkanime.com! 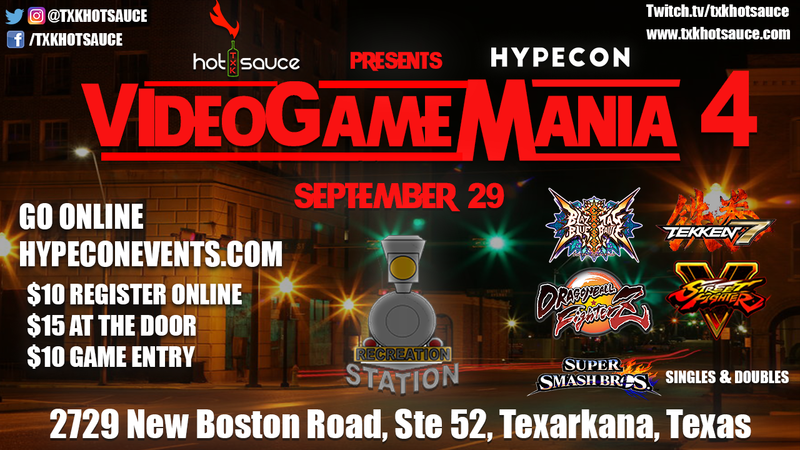 We will be streaming the Hypecon tournament in Texarkana, TX on March 17 & 18. We look forward to meeting everyone in the area and hope to be able to help put on a great event. For those that do not know Hypecon is a convention that will have guest voices actors, cosplay, video game tournaments and more. You can find out more details at the link below. See you there!